Toyota Corolla | Compare Cost of Ownership Today! See how well Corolla stacks up against other manufacturer models! Find out more about the Toyota Corolla Today! View All Vehicle Comparisons! BASE MSRP (INCLUDING FREIGHT) FOR EACH MODEL AND COST OF OWNERSHIP DATA OBTAINED FROM INTELLICHOICE.COM FOR 2018 MODEL YEAR AS OF JUNE 6, 2018: Corolla sedan le 4 CYL auto, MSRP $19,930; VW JETTA SE 4 cyl. auto, MSRP $23,095; CHEVROLET CRUZE LS 4 cyl auto, MSRP $20,400; NISSAN SENTRA S 4 cyl auto, MSRP 19,160; FORD FOCUS SE 4 CYL AUTO, MSRP 20,025 HTTPS://WWW.MOTORTREND.COM/INTELLICHOICE/ . BASED ON 2018 MODEL YEAR STUDY. MANUFACTURER PRICE INCENTIVES VARY, AND ARE NOT REFLECTED IN THIS COMPARISON AND COULD AFFECT PROJECTED 5 YEAR OWNERSHIP COSTS. 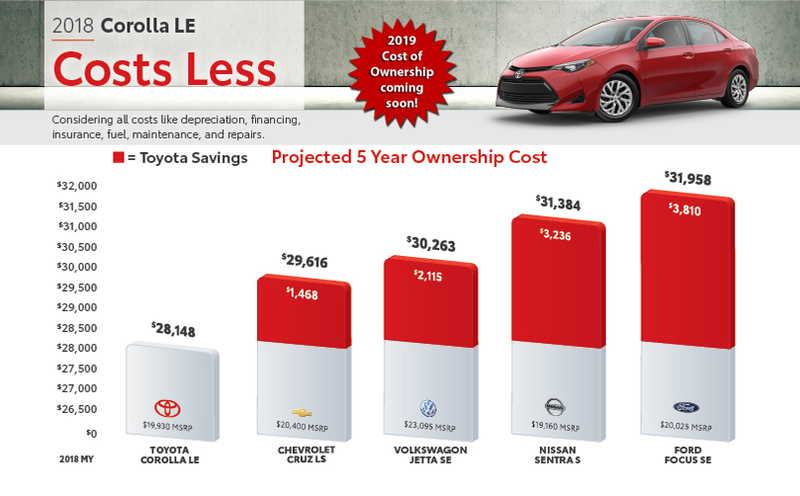 PROJECTED 5 YEAR OWNERSHIP COST FOR Corolla sedan le 4 CYL auto $28,148; VW JETTA SE 4 cyl. auto 30,263; CHEVROLET CRUZE LS 4 cyl auto $29,616 NISSAN SENTRA S 4 cyl auto $31,384; FORD FOCUS SE 4 CYL AUTO $31,958 . “CRUZE” AND THE CHEVROLET LOGO ARE REGISTERED TRADEMARKS OF GENERAL MOTORS LLC. THE VOLKSWAGEN LOGO AND “JETTA” ARE REGISTERED TRADEMARKS OF VOLKSWAGEN, LTD. “FORD,” “FOCUS” AND THE FORD LOGO ARE REGISTERED TRADEMARKS OF FORD MOTOR COMPANY. “NISSAN” IS A REGISTERED TRADEMARK OF NISSAN UIDOSHA KABUSHIKA KAISHA COMPANY. THE NISSAN LOGO AND “SENTRA” ARE REGISTERED TRADEMARKS OF NISSAN JIDOSHA KABUSHIKI KAISHA, TRADING AS NISSAN MOTOR CO., LTD. The road can be unpredictable. That’s why every new Corolla comes standard with Toyota Safety Sense™ P (TSS-P). This newly developed package of safety features combines a Pre-Collision Systemwith Pedestrian Detection (PCS w/PD), Lane Departure Alert with Steering Assist (LDA w/SA), Automatic High Beams (AHB) and Dynamic Radar Cruise Control (DRCC) to assist you. TSS-P’s comprehensive features create in-the-moment safety designed to support your awareness and decision-making on the road. We believe every journey should be a safe one. That’s why every new Corolla comes standard with the Star Safety System™ — our advanced suite of integrated safety technologies that includes Enhanced Vehicle Stability Control (VSC), Traction Control (TRAC), Anti-lock Brake System (ABS), Electronic Brake-force Distribution (EBD), Brake Assist (BA) and Smart Stop Technology ® (SST).Adding more peace of mind to your drive is a standard LATCH system to help keep children secure and safe, Whiplash-Injury-Lessening (WIL) front seats, and a Tire Pressure Monitor System (TPMS).